We’re proud to have local legend Mary Ann Nelson leading the Happy Olive Kitchen, putting our oils, balsamics, spice rubs and mustard to work! Mary Ann is the namesake of Fairhope’s iconic Mary Ann’s Deli, which she and husband John opened in 1983. In those days, the tiny cottage deli/café on De La Mare was one of a handful of restaurants anywhere in Fairhope – and grew a devoted following. Mary Ann’s culinary DNA is steeped in the traditions of her Sicilian grandmother and family roots from Long Island, NY. 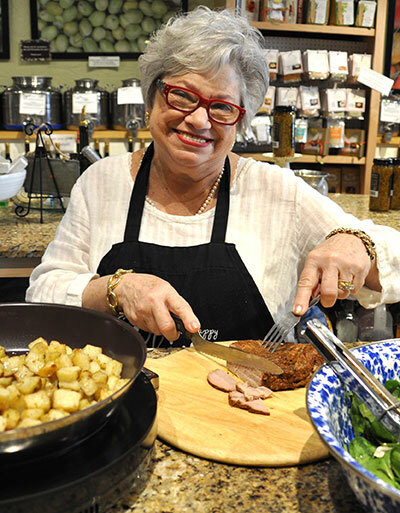 Mary Ann’s introduced Fairhope to European favorites like Nutella, imported olive oils and pastas. Signature dishes like the Nelson’s chicken salad, the “Shirley” and the “Fairhope” sandwiches remain favorites on the menu they sold along with the restaurant in 2005. Back in the kitchen again at the Happy Olive, Mary Ann hosts cooking demonstrations every other Saturday. Come join us for nibbles, priceless tips and recipes – and now Mary Ann’s own “Bop Bop” cookies!